[HD video below] Emirates took delivery of its first Airbus A380 on Monday. This particular aircraft features 489 seats with 14 in first class suites, 76 in business and 399 in economy class. The airline has also ordered two other versions of the A380, one with 517 seats in a three-class configuration, and the other with 604 seats in a two class layout. The new plane delivered Monday, features a wide range of innovations to help make journeys more comfortable and enjoyable, but the biggest surprise is definitely in the aircraft's premium cabin - First Class. First Class passengers will be able to relax in one of 14 private suites, with seats that convert to fully flat beds. The suites are equipped with an electrically operated door, mini bar, reading lights, work desk with built-in illuminated vanity mirror, personal electrically controlled mini-bar and room service feature. Other features include a fold-out mechanical table, a flower vase, a literature pocket, a credenza sideboard, wardrobe, forward and aft stationary panels and screens. To ensure passenger privacy adjoining centre suites in the middle of the First Class cabin have an electrically-operated privacy divider that can be raised and lowered. The suite is 82 inches (2.08 metres) long, with a seat that reclines from upright position to sleep position with a total length of 78.87 inches. The seat cushions are a comfortable 21.6 inches wide. The seat/bed is equipped with an electrically-operated leg rest, backrest, headrest, armrest, seat frame, leg rest extension and seat pan extension which enable the seat to convert to any preset position (upright, dining, or bed) or to any intermediate position between upright and flat-bed. The innovative seats also feature a multi-mode massage system with adjustable speed and intensity, and lumbar support adjustment. A touch screen Wireless Integrated Passenger Seat Controller allows passengers to control Emirates’ IFE (In-flight Entertainment) and seat functions. A 23-inch wide LCD screen is linked to Emirates' ICE inflight entertainment system while a PC power outlet, dual USB port and RJU headphone jack allows passengers to create their own entertainment. The most outstanding new feature, and something which will forever change First Class travel, is the Shower Spas. The First Class cabins on Emirates A380, in addition to all the above, also provide passengers with two fully-equipped bathrooms, complete with shower facilities. The two Shower Spas consist of a shower cubicle with water temperature / time control, vanity unit and wash basin, clothes changing area and toilet. A hairdryer and even a full length mirror have been installed. A 15.4-inch LCD monitor in each shower displays the live Airshow and tail camera output. Other features of the bathrooms include heated flooring, leather seating, and exotic flowers to create a relaxed ambience. To ensure passengers arrive at their destination in the best possible shape, the airline provides passengers with cosmetics that include perfumes by Bvlgari and Timeless Spa shampoo, conditioner, body moisturizer shower gel and exfoliate. The aircraft also features two bar areas, one exclusively for First Class and the other for both First and Business Class passengers. First Class passengers have the use of a fully-stocked bar, situated at the front of the First Class cabin on the upper deck. First and Business Class passengers can use the Lounge situated at the rear of the Business Class cabin on the upper deck. In addition to a fully stocked bar containing premium branded liquers and spirits and a selection of hot and cold canapés and snacks, there are two sofas, and a 42 inch LCD screen showing the aircraft’s position and views from its external cameras. 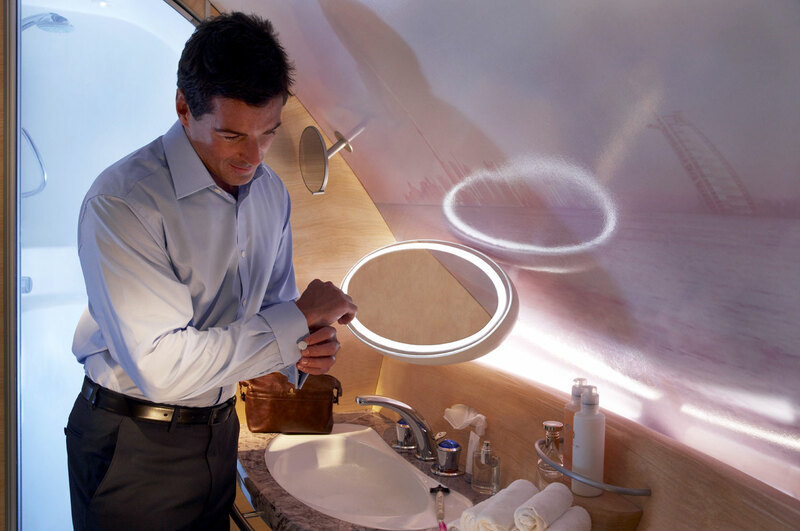 Each cabin features a unique, advanced mood lighting system, complete with a starlit sky. This adjusts throughout a flight to reflect the time at the destination, and to help combat effects of jet lag.